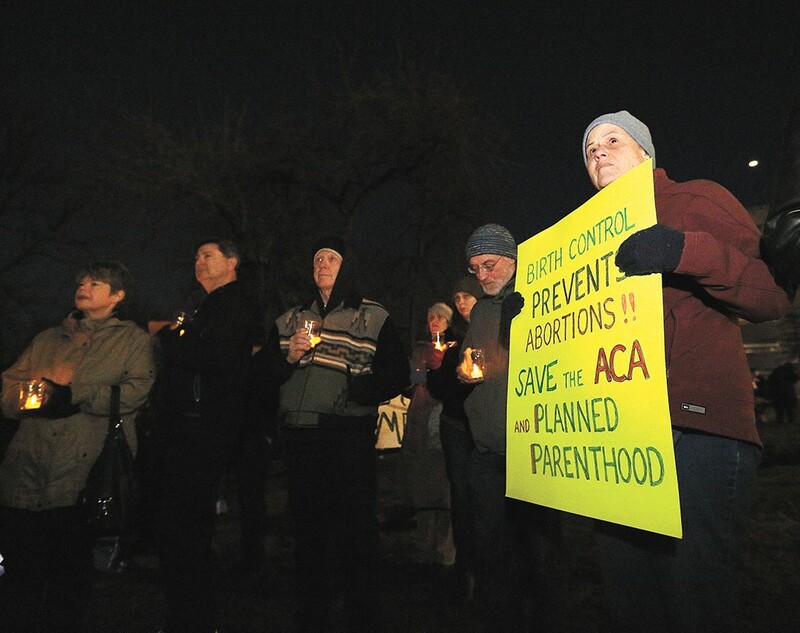 Margie Heller, right, shows her support for Obamacare at a candlelight vigil in Spokane on Saturday. This time last year, Sara LeTellier was checking into inpatient treatment for substance abuse. Like others who gathered at Cowley Park on Saturday night to share stories about the Affordable Care Act, commonly known as Obamacare, LeTellier was able to sign up for Medicaid and start treatment for addiction and bipolar disorder. The ACA expanded the program so more people were eligible. She was able to get into transitional housing and see a therapist. She's still in aftercare therapy, and now has a job helping others in similar situations at Pioneer Human Services. "I doubt I would be alive without it," LeTellier tells the Inlander in a hushed voice as the crowd, holding artificial candles in plastic cups, listens to the next speaker at the vigil. "My addiction had gotten so far gone, I'd lost everything." Republicans in Congress are pushing to repeal the ACA and replace it with the American Health Care Act, which in its current form would roll back some of that expansion in coming years. It would also limit options for those covered by Medicaid, including preventing them from going to Planned Parenthood. "It's a real slap in the face to say, 'We won't cover you anymore, your problems don't matter to us,'" LeTellier says of the Republican plan. Roughly 613,000 Washington residents have signed up for health coverage under the Medicaid expansion, according to a fact sheet from Gov. Jay Inslee's office. "Before the expansion, to qualify you had to be poor and something," says Cassie Sauer, president and CEO of the Washington State Hospital Association. "Poor and disabled, poor and elderly, poor and pregnant; you couldn't qualify just by income." The expansion allowed low-income Americans to qualify based on what they make, and get into the program if they make a little more than the federal poverty line. For 2017, someone working full time and making up to about $8 an hour (which is lower than Washington state's minimum wage) might qualify. Still, more than 80 percent of people covered under the expansion make a yearly salary at or below the poverty line, or about $12,000 a year for someone who is single. Washington state pays for the extra people on Medicaid with federal support, to the tune of $2.7 billion for the current biennial budget. If people who have gained coverage lose it, everyone else will feel it, explains Bob Crittenden, the governor's special assistant for health reform. Under Obamacare, the state has seen a $1.1 billion decrease in what's known as uncompensated care: When someone goes to the hospital and gets treatment but can't pay, it's either left as "charity care" or "bad debt." With more people covered, that amount goes down, especially as people are going to preventive doctor's appointments rather than waiting until it's bad enough to go to the emergency room. Among hospitals in the 5th Congressional District, which covers much of Eastern Washington, uncompensated care dropped from about $98.8 million in 2011 to about $26.8 million in 2015, according to the state hospital association. The Republican plan would stop providing federal assistance for the expansion in 2020, meaning that many will no longer have coverage unless the state can find a way to pay for it. The current estimate is Washington would need to find about $1.3 billion to add to the state budget in 2023 to keep the expansion in place. "Those with regular insurance will see an increase in their rates due to going back to paying for that uncompensated care," Crittenden says, "because the way you pay for that is you pay a higher rate in your hospital charges, and that in turn increases your premium." Hospitals, especially in rural areas, are concerned about making sure people don't lose coverage, says the hospital association's Sauer. "We are not at all saying the ACA could not be changed, or updated, or revised," she says. "People on Medicaid typically are working, but typically in jobs that do not have health insurance offered to them. The health care system works best, and community health works best, when everyone has access to care." Preserving access and preventing disruption in patient care, as well as protecting the expansion, is critical, says Elaine Couture, executive vice president and chief executive for Providence Health Care of Eastern Washington and Montana, which includes Sacred Heart Medical Center. "While we support greater flexibility for state innovations in Medicaid, Providence has serious concerns that the American Health Care Act will result in significant numbers of Americans losing their coverage under this program," Couture says via email. Providence is also concerned about changing the way Medicaid is funded, and wants to make sure that changes don't limit eligibility or access, she says. The proposed American Health Care Act also would prevent people who are on Medicaid from going to Planned Parenthood for services such as cancer screenings and preventive treatment, sexually transmitted infection and disease screenings and treatment, and to receive birth control, for one year. This is the so-called "defunding" of the service provider, but "defunding itself is a misnomer," explains Tiffany Harms, director of communications for Planned Parenthood of Greater Washington and North Idaho. The service provider does not get its own line in the federal budget, but accepts Medicaid and funding from other government programs, primarily Title X. Except in extreme cases, federal money already cannot pay for abortions, which made up about 5.9 percent of the services provided by the local Planned Parenthood affiliate in 2016. There are no clinics in North Idaho, and people come from as far as Montana to the local clinics for help, Harms says. "Defunding" the clinics by not allowing Medicaid patients to go there could mean that about 9,500 people treated in Spokane, Spokane Valley and Pullman in 2016 could lose access to care, Harms says.